This week our journey through our archaeological heritage takes us to Philadelphia County. The present day physical environment of the county is essentially as it was when Europeans first set foot here sometime around 1550 AD, when traders and trappers began their entrepreneurial relationship with the native Indians. Located in the southeastern corner of Pennsylvania, Philadelphia County is divided by two physiographic provinces: Piedmont Upland Section to the north and the Atlantic Coastal Plain to the south. The metamorphosed Wissahickon schist has its granite counterpart locally referred to as Swarthmore granodiorite. 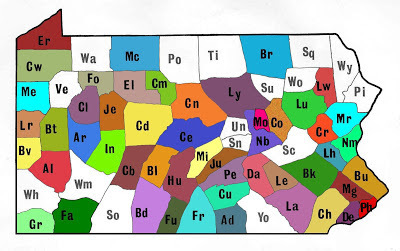 Other rock types found in the county include gneiss, limestone, dolomite and serpentine - a soft carvable rock used in building construction and hard-scaping. According to the U.S. Department of Agriculture Soil Conservation Service the principal county soil types are Urban land Chester association and Urban land Howell Association which are considered modified deep soils. The principal watersheds of Philadelphia County are the Delaware River, Schuylkill River, Cobbs Creek, Pennypack Creek and Wissahickon Creek. These, and a number of smaller creeks that flow to the Delaware River drain a total area of 135 square miles. Philadelphia County is surrounded by Bucks, Delaware and Montgomery counties on the southwest, west and north and by the Delaware River on the east. Pennsylvania’s only east coast seaport, Philadelphia, was founded after treaties were signed between William Penn and the Lenape Indians. 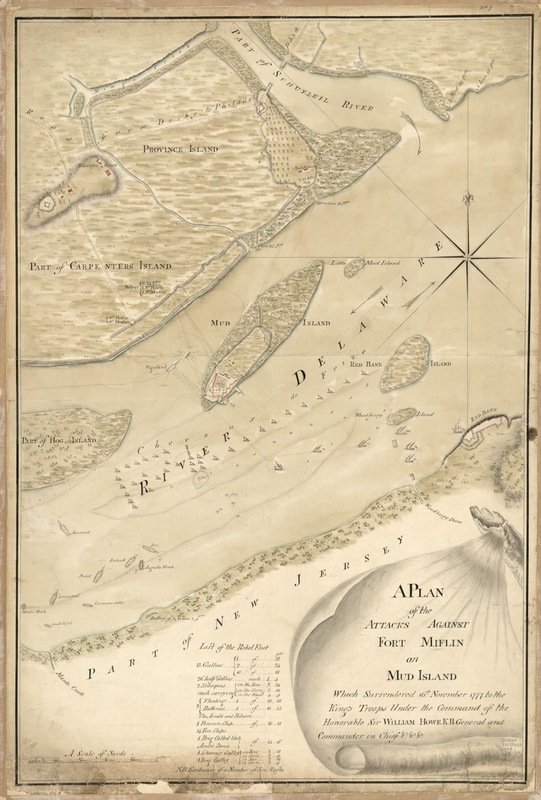 According to historians there were eight Lenape settlements in the county during the 18th century (Cacchione and Mion 1934; Donahoo 1928; Weslager 1956). These Indian towns were located at the junctures of streams and rivers and along their banks. Part of William Penn’s original land acquisition was eventually settled by Scandinavian peoples, however, since then the county has developed into a much more diverse population of over 1.5 million people. The Pennsylvania Archaeological Site Survey (P.A.S.S.) 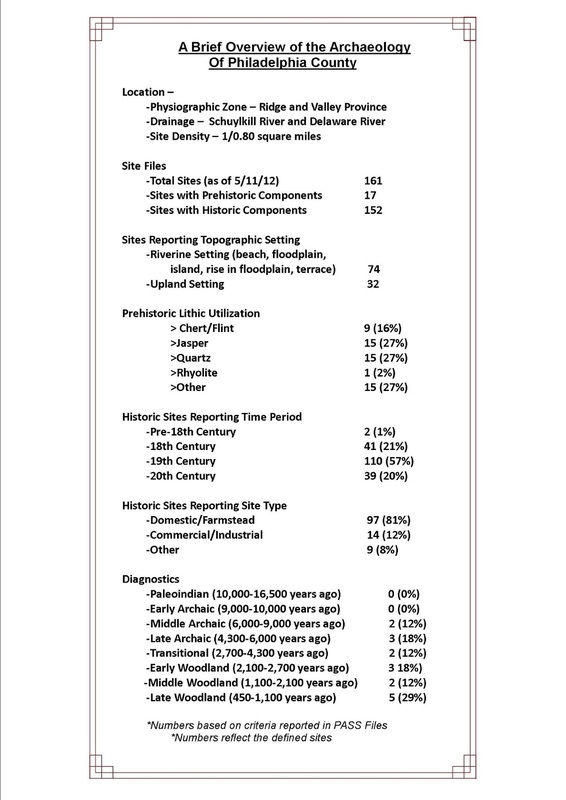 files list 161 archaeological sites in Philadelphia County. The list includes 152 Historic and 17 prehistoric components. Owing to the county’s low terrain, the majority of these sites are located on terraces and elevated floodplain features. Only 32 of the sites occupy upland settings and many of these are located in the Piedmont Upland Section setting located in the north half of the county. More than half of the recorded historic sites are of 19th century age followed by 18th and 20th century sites in nearly equal numbers. Breaking these sites down into functional categories show that most were domestic structures and farmsteads. Fewer are classified as commercial and industrial and nine others are not deemed as specific to any category. The low number of prehistoric sites (n=17) are representative of the Middle Archaic through the Late Woodland Periods. 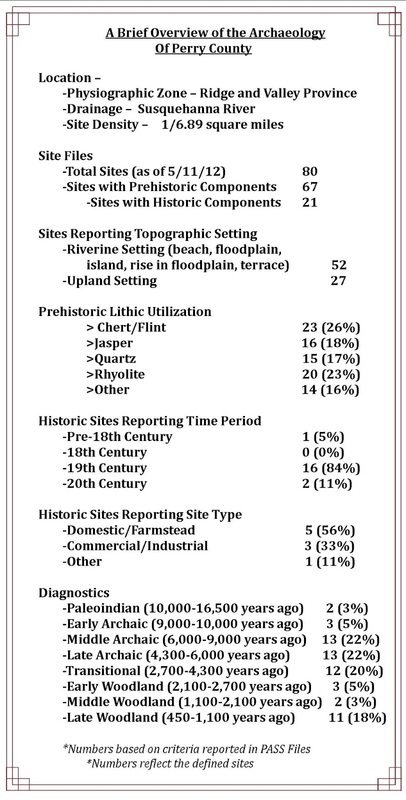 The number of sites is so small and the general region so urbanized as to preclude, in a quantifiable manner, the true distribution of prehistoric sites that once existed in Philadelphia County. Since the 1950’s there have been more than 150 archaeological site excavations in and around the City of Philadelphia (Cotter, Roberts and Parrington 1992). As noted in the P.A.S.S. files most of these sites relate to the Historic Colonial Period with a lesser number prehistoric (cf. Butler 1947, Rankin 1013). For brevity sake this week’s blog will only highlight a few of these investigations. This 55 acre tract is located near the center of Philadelphia County just to the north of Route 1. 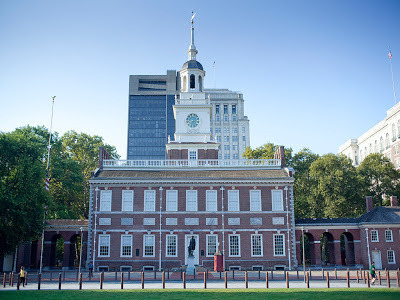 Within its confines is a series of important historical/archaeological sites that relate to the “Old City” historic district where Independence Hall was built and later used as a meeting house of the Second Continental Congress and the site of the Constitutional Convention in 1787. The Slate Roof House (one of the residences of William Penn) and Franklin Court, the location where Benjamin Franklin had built his house, were also investigated. Over the years other archaeological projects within the Park were undertaken, thereby yielding interesting discoveries, and the archaeology at Independence Square revealed many artifacts relating to the occupation of the property. Objects lost or intentionally discarded were common on and around the square. All told, the inventory exceeded 30,000 objects from prehistoric spearheads that were thousands of years old to pieces of glass and stoneware dating to the 17th and 18th centuries. In addition, park archaeologists identified three house foundations along with a brick and stone lined well and privy pits. Evidence of the British occupation during the Revolutionary War was unearthed in the form of cannon and musket balls and other military hardware. As required by Federal law, construction projects impacting potential archaeological and historically significant sites, must undertake surveys and excavations to identify, evaluate and excavate sites when necessary. 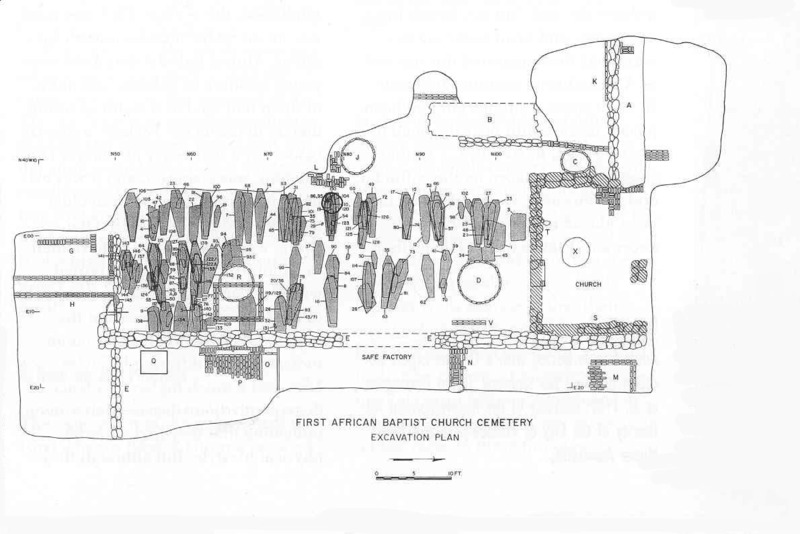 Such was the case at Tenth and Vine streets in the City of Philadelphia when the cemetery of the First African Baptist Church was rediscovered. The early to mid 19th century cemetery was uncovered during construction monitoring operations for the Commuter Rail Tunnel in Center City Philadelphia. Some of the graves were displaced beneath macadam and fill when the foundations of row houses and privies were dug into the old cemetery during the 19th century. In 1983 John Milner Associates archaeologists were responsible for the recovery and analysis of the remains which were later reburied at Eden Cemetery in Delaware County, Pennsylvania. Over the course of two field seasons 140 individuals ranging in age from only 14 years to 45 years were exhumed and the contents studied for osteological and burial custom information. Children and infants accounted for about half of the individuals buried in the cemetery. Grave shafts held from one to as many as five individuals, stacked one on top of another. Of special note were a number of individuals who had ceramic plates placed over their stomachs and a coin placed near the head. In some instances, leather shoes were placed on top of the coffin lid. These unusual discoveries indicated to the archaeologists that old African customs survived in the families of the deceased where as it was determined that material objects were useful in the afterlife, a belief still held by many world cultures. An archaeological investigation by URS Corporation contracted by PennDOT to survey and evaluate prehistoric and historic cultural resources existing along a three mile section of I-95 Corridor for road and intersection improvements recovered significant archaeological sites. (Rankin 2013). This section of the corridor is near Philadelphia’s Delaware River and within the Lower Delaware Valley Coastal Plain, an exceptional and ideal environmental setting and location for prehistoric sites. The six prehistoric sites identified during the survey range in time from the Late Archaic through Late Woodland periods and have yielded a range of diagnostic stone projectile points and associated tools typical of the established types for the region (Custer 2001). Attempts at linking Native American sites to historically known Indian towns has always been a challenge for archaeologists working in the eastern United States, a goal that is rarely achieved. The six sites located within the I-95 Corridor Improvement project are in the area of three known Indian towns, Shackamaxon, Tumanaranaming and Cohocksink, that once existed in the Philadelphia area. Unfortunately, none of those locations could be linked to these Lenape settlements. 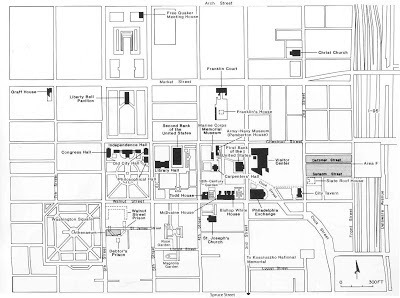 As stated earlier the information provided in today’s blog highlighting the archaeology of Philadelphia County is only briefly presented and the reader is referred to “The Buried Past: An Archaeological History of Philadelphia” (Cotter, Roberts and Parrington 1992) for a detailed in-depth discussion of the sites “in toto” and information about the detailed complexion of Philadelphia archaeology. We hope you have enjoyed this brief tour through the archaeology of Philadelphia County. Visit us next week when we will feature Pike County. 1947 “Two Lenape Rockshelters near Philadelphia.” American Antiquity 12(4):246-255. 1934 “Philadelphia Region When Known as Coaquannock, ‘Grove of Tall Pines’, and as First Seen by the White Men, with Indian Villages, Aboriginal Names of localities, Streams and Islands, and Their Interpretation.” Philadelphia City Planning Commission. Map on file at the University Museum of Archaeology and Anthropology, University of Pennsylvania. 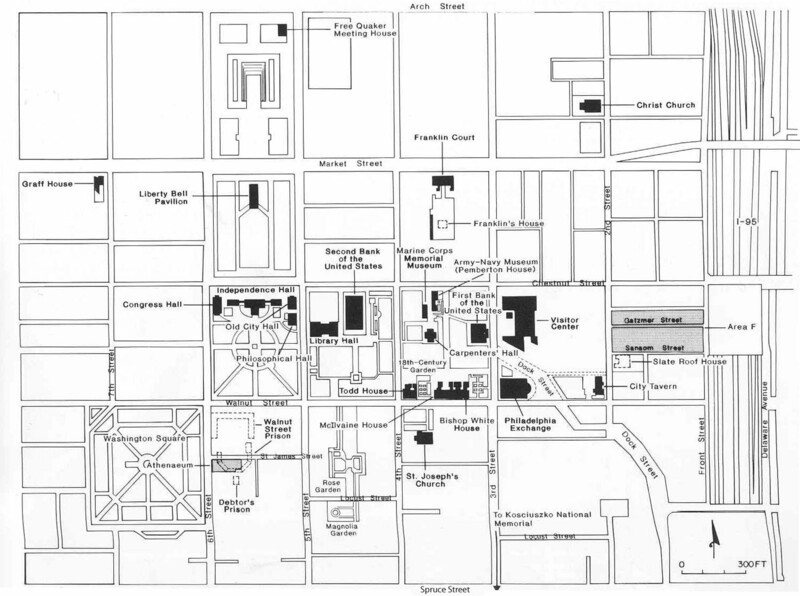 1992 The Buried Past: An Archaeological History of Philadelphia. A Barra Foundation Book, University of Pennsylvania Press. 2001 Classification Guide for Arrowheads and Spearpoints of Eastern Pennsylvania and the Central Middle Atlantic. Pennsylvania Historical and Museum Commission. 1928 Indian Villages and Place Names in Pennsylvania. Gateway Press. 2013 Revisiting the Wolf Walk: Exploring Philadelphia’s Delaware River Waterfront. Pennsylvania Archaeologist 83(1):22-44. 1956 “Delaware Indian Villages at Philadelphia.” Pennsylvania Archaeologist 26(3-4):178-180. This week our journey through the archaeological heritage of Pennsylvania brings us to Perry County, nestled in south central Pennsylvania between Cumberland and Juniata counties. Situated in the Ridge and Valley physiographic province, its terrain is characterized by long, linear mountain ridges and broad, rolling valleys. These sandstone and shale ridges typically range from 800 to 1200 feet above mean sea level in elevation and are fairly uniform. Their formation is the result of folding, faulting and erosion of sandstones, limestones and shales. The underlying soils are derived from these rocks resulting in dry, shallow soils. The drier ridge tops with shallow, nutrient poor soils, are distinguished by chestnut oak (Quercus montana) and black gum (Nyssa sylvatica) with red maple, other oaks, and an understory of shrubs including blueberries (Vaccinium spp. ), huckleberries (Gaylussacia spp. ), and mountain laurel (Kalmia latifolia). Some of these ridgetop woodlands also contain a significant component of pitch pine (Pinus rigida) and scrub oak (Quercus ilicifolia); these areas are known as Pitch pine-scrub oak barrens (Natural Heritage Inventory, pg.6). Archaeological evidence for native peoples in these upland settings accounts for almost 34% of the recorded sites in Perry County according to the Pennsylvania Archaeological Site Survey (PASS) files. Poor soil associated with these ridgetops, makes the broad valleys and associated rivers and streams a much more likely settlement area and this behavior is reflected in the archaeological record. The county is bounded on the east by the Susquehanna River, and contains several smaller streams such as the Juniata River, Tuscarora Creek and Shermans Creek provide. These riverine areas harbor 52 (65%) of the 80 sites recorded in the PASS files for Perry County. Tuscarora State Forest in western Perry County contains remnants of an old growth virgin Hemlock stand in the Hemlocks Natural Area. Forested valleys were a mix of hemlock, basswood, sugar maple, sweet birch and an understory of ferns, sedges and berry shrubs. Careful examination of soils from certain archaeological excavations reveal seeds and pollens from many of these species and aide archaeologists in creating a “painting” of the environmental setting of a site. An archaeological investigation conducted prior to construction of a gas pipeline project in the mid 1990s yielded significant data relating to pre-history of Perry County and specifically contributed new information to our understanding of the Clemson Island culture. Located along the west bank floodplain of Shermans Creek is the Miller Field site (36Pe2). This site produced over 5,000 artifacts and fifteen cultural features comprised of fire pits/hearths, one postmold pattern - probably representing a house feature, and four large multi-use pits. Three radiocarbon dates were obtained here and they coincide with the site's Late Woodland Clemson Island pottery, establishing a date of occupation between A.D. 805±30 and A.D. 1290±30. Research and analysis of the data by archaeologists determined that this site was a small multicomponent, seasonally occupied camp or single farmstead utilized by native peoples from the Transitional period (2,700-4,300 years ago) through the Late Woodland period (450-1,100 years ago). 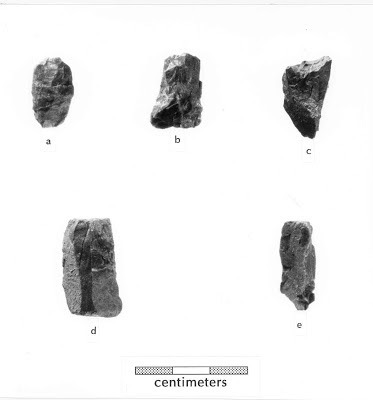 Examination of flaked stone tools, unmodified cores and core fragments provided evidence of projectile point manufacture and resharpening of points which occurred frequently at the Miller site. Stone tools were made from small blocks and stream pebbles using a combination of hard and soft-hammer percussion techniques. Microscopic analysis of wear patterns on these tools indicated varying degrees of unifacial and bifacial wear on primary and secondary trimming flakes. These wear pattern analyses suggest their use in cutting and scraping, activities related to food processing. Very few faunal remains were evident, but an abundance of nuts, fruits and seeds were identified through flotation recovery. These included grape, strawberry, blackberry, hickory, chestnut, and cultivated maize. A recurring presence of carbonized nuts and maize was identified as an indicator of occupation during late fall and early spring. Clemson Island ceramics were analyzed in relation to vessel size and function. Typical ceramic types included Cordmarked, Levanna Cord-on-Cord and Clemson Island Punctate. Archaeologists observed a trend among these various forms, which were dated on feature contexts. Once introduced, the ceramic types remained in use through the Clemson Island Culture continuum. This comprehensive examination provides researchers with an in-depth analysis of the site, but more importantly provides site context and a broader understanding of cultures thereby strengthening our understanding of our Commonwealth's prehistory. More recent archaeological investigations were conducted along the Susquehanna River at Liverpool, PA. There, Route 11/15 was widened and the resulting yielded data revealed some of our earliest occupation periods in Pennsylvania. Excavations at 36Pe16, the Wallis site, have provided evidence of a seasonal occupation beginning 11,000 years ago. Various pre-historic artifacts were recovered including six fluted points or point fragments, two Clovis-like points and several Early and Middle Archaic points (6,000-9,000 years ago). Over 590 other tools were found which consisted of knives, drills, gravers, spokeshaves, scrapers, and "beaks". 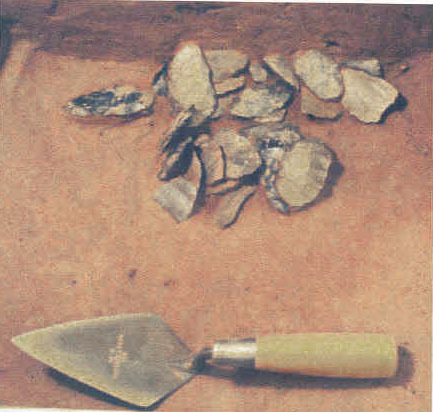 Of the approximately 700 ground stone tools recovered, 38% of were hammerstones. Other ground stone tools included netsinkers, atlatl weights, choppers, pitted/nutting stones, anvil stones, hoes and axes. The Paleoindian (10,000-16,500 years ago) group use of the site was likely as a butchering or hunting camp. During the Paleoindian period the Wallis (36Pe16) site was a sand- and cobble-covered riverbank, approximately seven feet lower than the current ground surface. This area was frequently flooded and it is likely that any camps would have been located on a higher terrace, more suitable for short term, seasonal occupation. Microwear analysis of spokeshaves (tools with a concave edge used for shaping and smoothing shafts such as arrows or tool handles) was used to identify wear patterns as indicators of tool function. Scrapers and gravers, both associated with butchering and cleaning hides and processing bone, were also examined. The edge wear analysis identified activities related to hunting, butchering, hideworking and the manufacturing tools of stone, bone, wood and antler. Tools made from high-quality Onondaga chert and fine-grained black cherts, indicate a large foraging territory which extended several hundred miles from the site. These activities all indicate a broad subsistence diet. The same is true for the Early Archaic period. One thing of note is that the artifact densities increased during this period indicating the presence of multiple occupations. Soils examined during the excavations yielded pollen samples that indicate a spread in the forested areas and grasslands disappeared. Riparian vegetation growing along the riverbank included cattails and members of the lily family, which have edible tubers. Archaeologists also recovered the bones of coyote, and either wolf or fox, indicating consumption of these animals during this time. A cache of stone tools which had been set aside apparently for later use, suggests a planned return to the site that did not materialize. Fifty-two leaf-shaped tool blanks dating to around 7,000 years ago, made from various stone materials from as far as the Ohio River Valley and as near as the lower Susquehanna River Valley were also discovered. The hunter-gatherers who left this cache operated in a large foraging territory or had an expansive trade network with other groups. Given the location on the banks of the Susquehanna River, either explanation is plausible. During the Middle Archaic period (6,000-9,000 years ago) the site was discovered to have evidence of agriculture based on the findings of a digging tool, a chopper, and pitted stones. During the Late Archaic period at least 5 periods of occupation were present. . Stone tools recovered included a netsinker, three pestles and grinding stones used to perform a variety of butchering and processing tasks. Hideworking was still being done as well as woodworking, soft stone boring, and fashioning of bone tools based on the microwear analysis. The presence of many hearths and other features implies that there were larger groups of people utilizing the landscape for longer periods of time. Stone tools of this period were made using local cherts, indicating a smaller foraging territory. During the Transitional Period the site was a base camp of relatively long duration used by large groups. Some of the things consumed at this site included foraging foods as well such as nuts, acorns, and various fruits. Other food sources included large, medium and small mammals as well as turkeys, grouse, and quail. The lithic artifacts provided evidence for temporal changes in point style, technology, and lithic type use. The wide variety of wild plant foods recovered during this period and the observed residues inside steatite vessels provide strong evidence for the presence larger bands of people and the need to obtain additional food sources leading into the Woodland period. The excavation at Wallis site (36Pe16) produced an abundance of information thereby improving our understanding of some of the earliest occupation periods along the Susquehanna River, but due to its location along a floodplain it offered very little evidence for later Woodland occupations. Archaeologists must excavate and examine a multitude of sites in order to look at and understand the broader picture of Pennsylvania prehistory. Fortunately, the combined data from these projects provide a more comprehensive view of activities by native peoples in Perry County than was once thought. We hope you have enjoyed this short overview of Perry County and that this will inspire an interest in recording and preserving the archaeological sites in your community. These resources are Pennsylvania’s heritage and for all of us it is our window into the past. Help us to protect and preserve these archaeological resources which are crucial to our understanding of the past. We encourage every citizen to take an active role in preserving our archaeological heritage and ask that you respect these sites and Preserve our Past for the Future. Commission for the Pennsylvania Department of Transportation, 2009. Miller, Ph.D. Patricia E., James T. Marine, M.S., Frank J. Vento, Ph.D.
Archaeological Investigations Route 11/15 Improvements (SR0011, Section 008) Juniata and Perry Counties, Pennsylvania. ER No. 1989-0381-042. Unpublished Manuscript, Section of Archaeology, The State Museum of Pennsylvania. On May 17th, the Archaeology Section of the State Museum of Pennsylvania began assisting Cedar Cliff High School (West Shore School District, Cumberland County, Pennsylvania) with a three week simulated archaeological project. As part of Mr. Daniel Reilly’s AP World History class, 17 students are spending 80 minutes per day learning about and doing archaeology at a simulated site near the sports stadium. For these students, it becomes experiential learning and a multi-disciplinary experience they will be able to link to their other classes such as science and mathematics. A simulated archaeological excavation can be defined as an experimental project organized by a classroom teacher that has an educational goal of reconstructing human behavior using archaeological techniques (Chiarulli et al. 2000). Although, students can learn about archaeology and archaeological methods in a classroom setting, there is nothing like a hands-on experience through a simulated excavation. In the past, the Section of Archaeology at the State Museum has worked with Susquehanna High School on a very popular forensics archaeology project and now another high school is getting involved in archaeology as a way to enhance the educational experience of their students. The field work actually began several weeks ago, when Mr. Reilly (assisted by several other teachers who were intrigued with the project) created a mock archaeological site by burying artifacts in the ground. They created a multi-component site; that is, one dating to both historic Euroamerican times and one dating to a Native American occupation prior to the arrival of the Europeans. 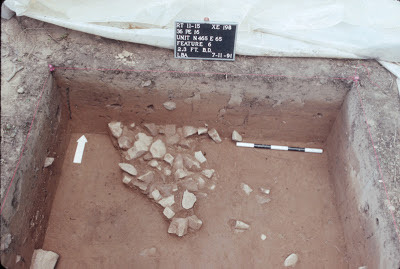 The artifacts buried in the Native American camp site included a fire-cracked-rock hearth or oven with charcoal and food remains situated next to a pile of flakes from the production of stone tools (debris created by an actual flint knapping demonstration). In the corner of the site, three burials were placed; not actual human remains, but deer skeletons aligned in a human-like fashion – thus creating the “deer people”! The Euroamerican site is represented by a brick fireplace with charcoal, broken dishes and food remains. Mr. Reilly registered the site with the Pennsylvania Archaeological Site Survey and was assigned the number of 36CU0210. The students began with several days of classroom related work where they were taught the difference between archaeology and paleontology; that archaeology is a subfield of anthropology – the study of human cultures; the nature and significance of stratigraphy; and the importance of archaeological context or the location of the site and the three dimensional location of the artifacts within it. The students were treated to a flint knapping demonstration where they were offered the opportunity to try their hand at chipping stone into tools. At the end of this class, they attached their tools to wooden handles to experience actually using stone tools. Mr. Reilly holds a Masters degree in Archaeology from Queen’s University of Belfast in Northern Ireland where he has excavated Bronze Age, Iron Age, and Medieval sites. He also spent four years conducting compliance archaeology (i.e. archaeology conducted in compliance with historic preservation laws such as the National Historic Preservation Act of 1966 or the State History Code) in the Middle Atlantic region before becoming a teacher. He is very excited about this project but it required a lot of planning and effort on his part. Working with a limited budget, he received assistance from The State Museum of Pennsylvania, Section of Archaeology in the form of equipment (shovels, buckets, tapes and screens). Perhaps next year, someone will be willing to donate these materials as a permanent contribution to this ongoing project. Just as importantly, a staff person from the Archaeology Section of the State Museum was on hand most days to help with the management of his crew. Field work began with the students conducting a controlled surface collection across the ten meter (30 feet) by sixteen meter (48 feet) site, placing flags where artifacts were found. This was followed by a lesson on the Topcon total station (a laser based electronic transit and data recorder) from a staff person from the State Museum and laying out the excavation grid. Archaeology is all about mapping and identifying patterning in artifact distributions. Everything needs to be mapped! The State Museum recently received a new data recorder which was generously donated by Productivity Products and Services, Inc. in Saxonburg, Pa. This recorder replaced one that was nearly 20 years old and no longer functioning. This donation allowed us to demonstrate current data collection methods and produce detailed and accurate site maps of the excavation. A special thanks goes to Randy Miller of Productivity Products and Services, Inc. for his time and expertise in helping us set up and make use of this new equipment. Based on the controlled surface collection, eight teams of two students each selected a one meter unit for excavation. Using the principles of the Pythagorean Theorem (A squared + B squared = C squared), the students placed stakes at the corner of their squares, connected them with string and started excavating. The plowzone is removed with shovels and the soil is screened through a ¼ inch mesh shaker screen. The students were taught that the artifacts in the plowzone have been disturbed and their context has been compromised. Consequently, they do not need to be mapped with the same precision as those found at deeper levels in undisturbed soil layers. But, once in the subsoil, they began to more carefully dig with trowels. The field work portion of the project concluded on June 5th so students could prepare their reports. Each team was responsible for taking detailed field notes to document the location of features and the artifacts found in them. In the lab, the artifacts will be examined and a report developed that documents the methods and the findings. The students enjoy finding “stuff”, but they will also enjoy weaving the story of how the artifacts ended up at the site. Each student’s excavation report will include a review of excavation methodology, an analysis of recovered artifacts, conclusions drawn about each “culture” based on that analysis, and a recommendation for further work at 36CU0210. Archaeology is a multidisciplinary study and allows teachers to demonstrate basic principles of science, geology, biology, mathematics, history and anthropology. Simulated archaeological projects can be a learning and entertaining experience for the students where they use archaeological data in a multidisciplinary program to develop critical thinking skills. The public frequently feels that archaeologists guess or speculate about how people behaved in the past. In fact, archaeology is a science and archaeologists develop hypotheses which are tested at archaeological sites. A simulated archaeological project demonstrates a systematic approach to scientific discovery and it emphasizes behavior rather than artifacts. Participation in this project and other outreach programs provides an opportunity for staff at the State Museum to educate the public in understanding archaeological methods and improves the image of how archaeology is accomplished. 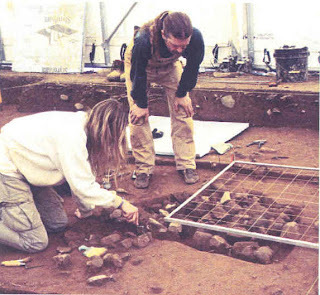 In summary, an archaeological field experience for high school students allows teachers to answer the age old question often asked by students when taking science math, etc… – “Why do we have to know this stuff?” This experience leads students to see a direct application of how other disciplines tie into creating the ‘big picture’ and allows them to understand why all learning is important.